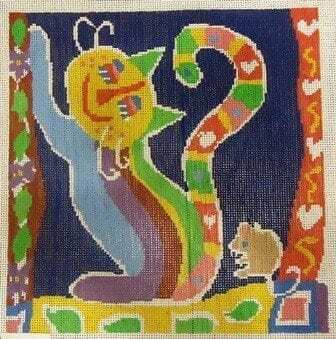 This crazy colored kitty is done by Jean Smith, located here in our own state of Michigan! Painted on 13 ct, it measures 10″ square. Bright happy colors of blue, purple, magenta, yellow, lime green, peach, navy and more will bring this picture to life. We’ll be happy to send you threads – just ask.